Wayne Allen | Daily Times Justin Clark, Administrative Director of Plant Operations at Southern Ohio Medical Center is pictured addressing member of the Portsmouth Area Chamber of Commerce. 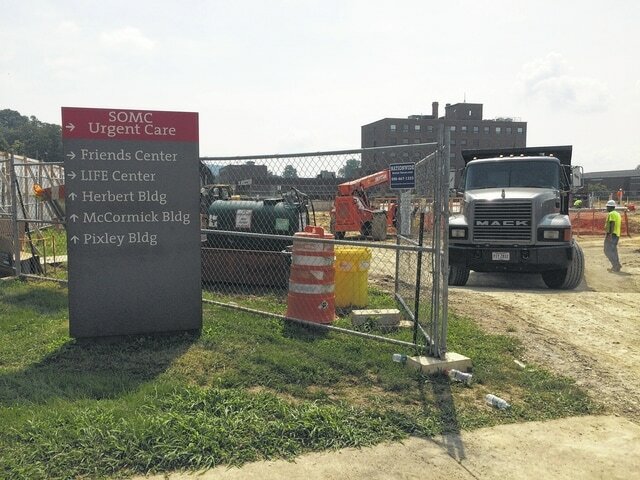 Photo by Ryan Ottney | Daily Times Among its many development projects, Southern Ohio Medical Center is building a 50,000-square foot multi-story health care facility on its South Campus. Justin Clark, administrative director of plant operations at Southern Ohio Medical Center (SOMC), was the keynote speaker at the Portsmouth Area Chamber of Commerce Annual Awards Breakfast on Tuesday. Clark delievered an update on current and future projects. As administrative director of plant operations, Clark oversees all maintenance operations, new construction of building and facilities at SOMC. Over the course of his presentation, Clark discussed ongoing changes to the hospitals main campus and other facilities. “Historically hospitals will build very large robust centers, for people to come to the hospital for service. We’re now spending lots of time, money and energy deconstructing these large robust systems and putting the services in the communities where people are,” Clark said. SOMC has formed a partnership with Smith’s Pharmacy to open a facility in South Webster. Smith’s opened a pharmacy and SOMC has placed a Nurse Practitioner in the pharmacy. Clark said the services offered by SOMC there include primary care as well as general laboratory services. He said they see patients 12 years old and up. They also offer same day sick appointments. Clark said SOMC has also moved into Greenup County, Kentucky. He said SOMC’s facility is located next to Tammy Jo’s Dance Studio in Greenup. He said SOMC has a Nurse Practitioner at the facility. Clark said at the Greenup facility they see patients 12 years old and up and provide primary care services and same day sick appointments. SOMC has broken ground on a new facility in West Portsmouth, close to Riverside Park. He said the facility is currently under construction, with a goal of being open in late fall. “We’re going to have primary care, though a nurse practitioner and they will offer a few different things. At the West Portsmouth facility we’re going to have even more extended hours and weekend appointments,” Clark said. SOMC also broke ground earlier this year for an expansion project on its south campus in Portsmouth. He said with the opening of the new facility on the south campus, SOMC will have urgent and family care. He said once the new facility on the south campus is complete, it will include medical imaging, laboratory services, occupational medicine as well as a new data system that will support the entire SOMC health care system. Clark said it’s anticipated the facility will be complete in fall of 2016. He said SOMC has recently opened an urgent and family care center in West Union. The facility is open seven days a week and opens for walk-in appointments. Clark said SOMC has also recently purchased land in Wheelersburg, with the intent on constructing a family health center. He said there is a team within SOMC that’s working to determine the scope of services that will be offered at the facility. He said there is no date for construction, but design work is underway. Clark said SOMC has recently undergone efforts to expand availability of parking on its main campus. He said the employees that park on the east campus or on the Christ’s Community Parking lot are bused to the main campus. “We’re in the process of building a new parking lot on the west side of our facility along Sherman Road that will be about 200 spaces. This will alleviate congestion in the parking garages and on that side of campus,” Clark said. He said SOMC has also realized it may be a struggle some people may have getting from the parking lots to a doctor’s office. He said services that will be located in the Braunlin Building include Orthopedic Services, Neurology and Physical Medicine and Rehabilitation, to name a few. He said this assessment is being conducted to make it easier for visitors and patients to find their way while at SOMC.